Many DLP printer makers experience a brightness fall-off of their projected images towards the edges of the vat floor. This will lead to inhomogeneous curing of the resin and therefore failed prints. 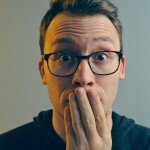 In this post, I will explain the reason for this effect and provide a simple solution using Monkeyprint. This is what most 3d DLP printer makers see at the bottom of their vat during illumination: A light intensity distribution with a fall-off towards the edges. It is most notable in the corners and can lead to over-exposure in the center or under-exposure in the corners. Both effects can make a print fail. The inhomogeneous DLP printer brightness distribution results from two effects: The given brightness distribution of your projector, reflection and absorption by the vat floor and natural vignetting at the vat floor. Every projector will have a brightness fall-off towards the edges of the image. This can be experienced with almost any projector and unfortunately there’s nothing we can do about it. All of theses three effects depend on the incident angle at which the light from your projector hits the vat floor. In the center of the vat, the incident angle will ideally be α = 0° (this means normal to the vat floor) and towards the edges the angle will become more oblique. A 3d DLP printer’s projector is essentially a point light source. This means that the light will hit the vat floor at different incident angles which affects the light intensity distribution at the vat floor. Absorption happens because your vat floor is not 100% transparent and will therefore absorb some of the light. The amount of absorption depends on the distance d that the light has to travel through the glass. This distance will be the shortest if the light hits the vat floor at an incident angle of α = 0°. The more oblique the angle gets, the longer the distance and the amount of absorption will be. Therefore, absorption will increase from the center (α = 0°) towards the edges (α > 0°). Higher angles of incidence (right) increase the distance the light has to travel through the vat floor. This will lead to higher absorption. Natural vignetting results from the same phenomenon that makes winters cold and summers warm. A light ray of a given diameter will illuminate a specific area when falling onto a surface. Compared to an incident angle of α = 0° this area will increase if the ray hits the surface in a more oblique angle (α > 0°). If the same amount of light illuminates a larger area, this will result in a lower light intensity. As with absorption, the brightness will decrease from center to the edges of the vat floor. Light rays hitting the vat floor at different angles. The illuminated area will increase with the incident angle. 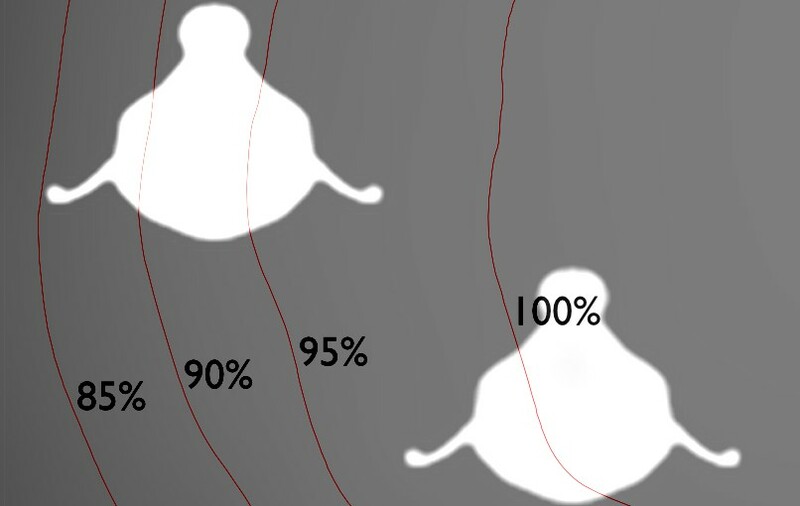 As the amount of light stays the same, the intensity decreases for larger incident angles. Reflection of light will happen at all positions of the vat floor. The amount of light that is reflected depends on the incident angle. For glass, it will be the smallest (about 3.5%) at incident angles of α = 0°. As the angle grows towards the edges of the vat, the amount of reflection will gradually increase. At α = 30° it will be about 7% according to this article on reflection. The following diagram shows the combination of all the effects taking place at your vat floor. Various effects add up to define the brightness distribution on the vat floor. The projector comes with a given brightness distribution, the vat floor absorbs and reflects light. Also, there is natural vignetting on the vat floor. All these effects will lead to a decrease of light intensity towards the vat edges. All these effects can lead to a strong fall-off of the vat floor light intensity towards the edges. In the Groningen printer we experienced an intensity decrease of 24% in the corners of the vat. First, we can deduce a simple rule from what we’ve learned before. All the negative effects described above increased with the projector light’s incident angle. So the first step when aiming for a homogeneous light distribution should be to decrease this angle. 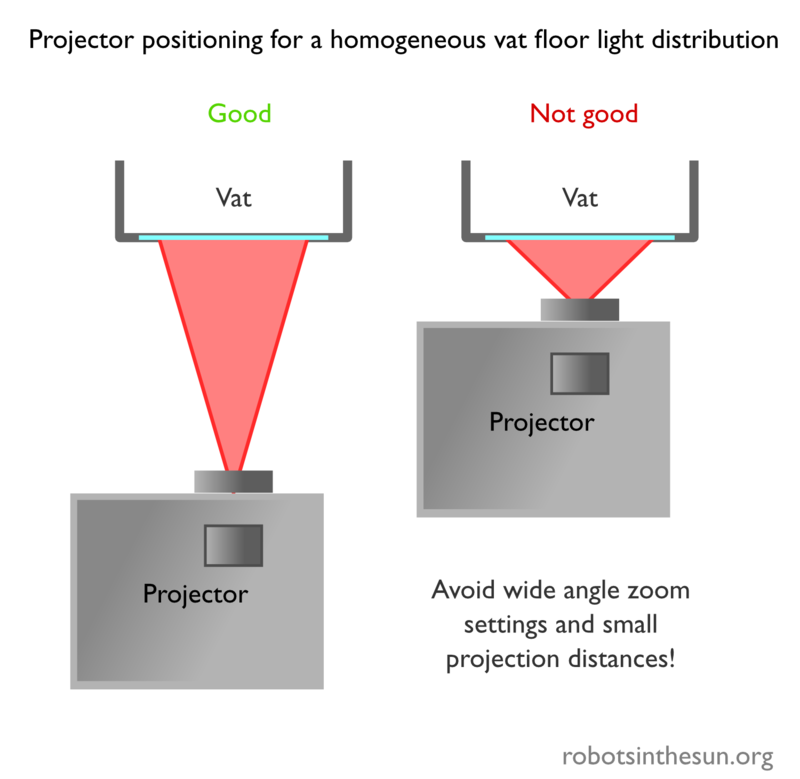 Although it might be tempting to position your projector as close as possible to your vat using the widest zoom setting, this will lead to inhomogeneous light intensity distributions. It is better to use a telephoto zoom setting and a larger projection distance. This will reduce the negative effects resulting from large incident angles. Additionally, I have implemented a calibration image setting in my Monkeyprint DLP print software to resolve an uneven brightness distribution. It has two steps. The first is taking a calibration image of your illuminated vat floor which will show the brightness distribution. The second is to use this calibration image to adjust your slice images for a homogeneous brightness distribution. In this process, you will use a digital camera to take an image of your illuminated vat floor. As a camera is an optical instrument, it will show vignetting itself which needs to be taken into account as well. First, we will extract the vignetting of your camera. To do so, take a photograph of the white surface in a bright, evenly lit surrounding. Important: Adjust your camera’s settings so that the image is as bright as possible without being over-exposed. The result will not be white completely but will tend to get darker towards the corners. This is the vignetting of your camera’s lens which we need to take into account when creating the vat floor calibration image.  To finish off your camera vignetting image, load it into a graphics software like Gimp, convert it to gray scale (Image > Mode > Grayscale) and adjust the brightness so that the brightest spot (usually in the center) has a value of 100%. To do this, sample the brightness at the brightest spot using the Color Picker Tool. Create a new layer and fill it with a gray value of 100 minus your sampled value. Set the layer mode to Addition. Now the brightest spot will have a brightness of 100%. 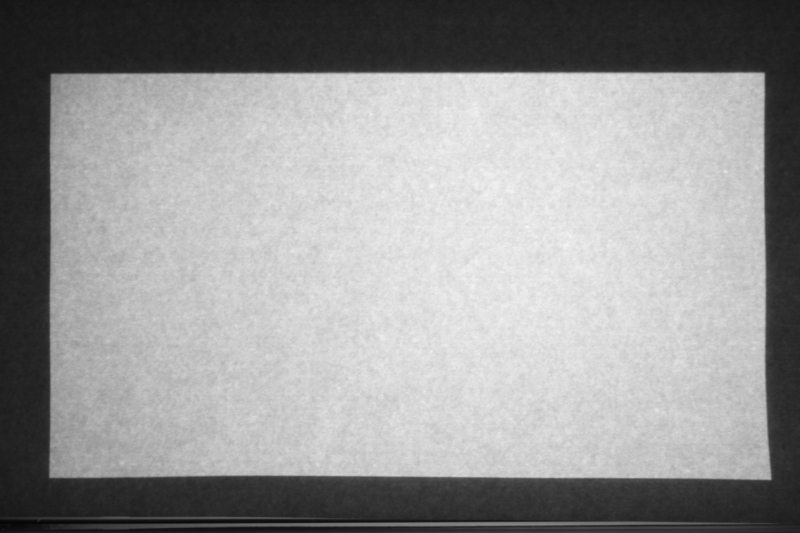 Left: Camera vignetting image of a white surface.  The image shows a notable brightness decrease towards the corners. Right: camera vignetting image with adjusted brightness so that brightness is 100% in the center. Then, fire up your DLP printer’s projector and throw a white image onto your vat floor. Place the piece of white paper in your vat. Mount the camera onto your tripod and point it down vertically onto the vat floor. Try to get the vat leveled in the viewfinder. The vat should appear rectangular with as little distortion as possible. Take an image of the illuminated vat floor. Again, adjust your camera’s settings so that the the image is as bright as possible without being over-exposed. The gray scale vat floor image taken with a digital camera. It is important to capture the vat floor with as little distortion as possible. Next, we need to correct the vat floor image for the amount of vignetting that was introduced by your camera. To do so, load the vat floor image into Gimp. Then load the camera vignetting image as a new layer. Invert the camera vignetting image layer and set the layer mode to Addition. This will brighten the vat floor image by the amount of vignetting that was introduced by your camera. The vat floor calibration image with and without camera vignetting image added. In the original image the corners are notably darker while in the corrected image the are brightened to a degree where the dark frame becomes more homogeneous. The corrected image now shows the actual vat floor brightness distribution. Now, you need to crop your vat floor image. In Gimp, activate the Rectangle Select Tool. In the tool options, set the Aspect Ratio to Fixed and enter your projectors resolution (1920:1080 for a full HD projector). Now, drag a rectangle over the image of the vat floor, that lies just inside of the bright area. In the menu select Image > Crop to Selection. In a last step, get rid of the paper texture that might be apparent in your image. Select Filters > Blur > Gaussian Blur and set the Radius to something like 100 px. The image should not look patchy anymore. The final vat floor calibration image which will be used to adjust the slice images in Monkeyprint for a more homogeneous DLP printer brightness distribution. Congratulations, your vat floor calibration image is now ready! To use it during prints with Monkeyprint, commence with step 2. 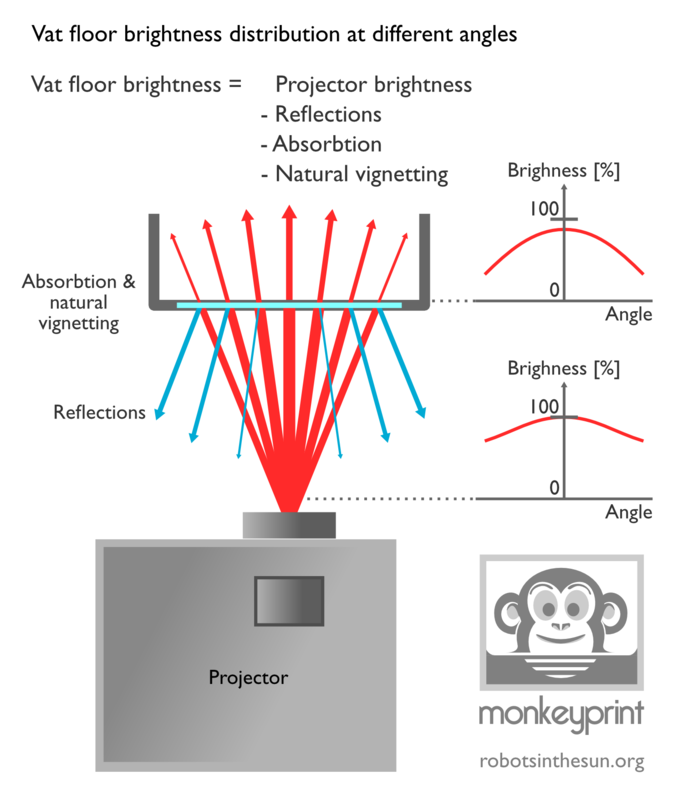 Monkeyprint now has a method to adjust the slice images according to your vat floor calibration image. You can supply a calibration image in the settings dialog. Simply go to Options > Settings, click on the Projector tab and load your calibration image. Simply load your calibration image in the Monkeyprint settings dialog. During slice preview and printing Monkeyprint will darken the slice images in regions where the calibration image is brightest and retain the brightness where the calibration image is dark. The result will be a slice image that equalizes the brightness distribution created by your projector and the vat floor, resulting in a homogeneous exposure during prints. Monkeyprint will create brightness adjusted slice images if you have supplied a calibration image in the settings dialog. If you like this or if you have questions or remarks, please use the comment function below. That’s what I want to have for my DLP. Thanks for this great implementation. Taking photo and manipulating it with a software is a good solution. I want to ask if we can measure the UV illumination with an uv sensor and generate the image. What kind of sensor can we use? Measuring the uv wavelength is more meaningful that taking the photo of the visible spectrum. What do you think? I’ve just done some reading on UV photography. Seems like it takes some modifications to your camera (removing UV filter, having UV passing filter on the lens etc). Your suggestion might also be good and is easy to implement. You could take a UV sensor like this one and measure the intensity in all four corners and in the center of the vat floor. Then, average the four corner values and divide the result by the center value. You could then create a calibration image with a radial gradient ranging from a value of 1.0 in the center to the result of the above calculation in the corners. What I have in my mind is a grid print out. I mean a paper which has 10mmx10mm squares on it. You will put this print out in your vat and start the projector with a white image. People will use the sensor on the corners of the squares and press the button to record the uv to analog voltage at that points. 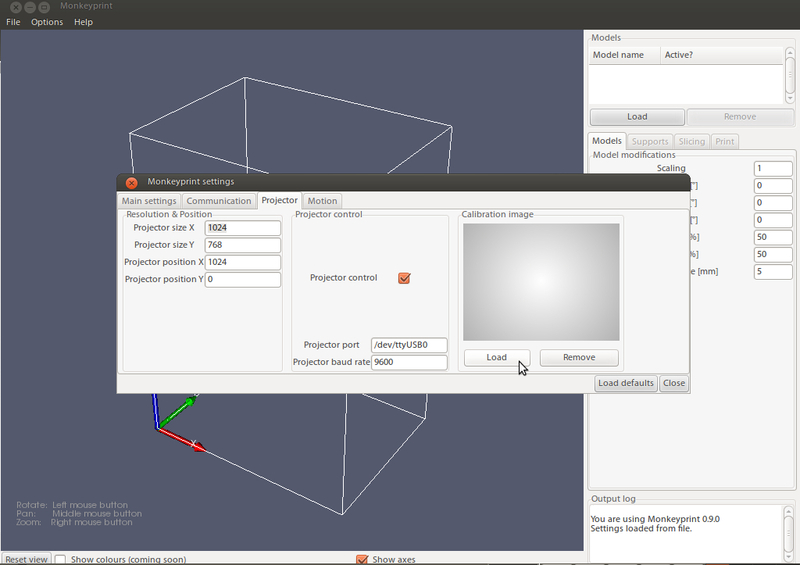 The software will generate the filter image. If you can implement it inside the Monkeyprint I can work on the hardware side. The sensor can be added to my board I believe and the in the software a calibration procedure could be implemented that automatically projects spots of white on the vat floor at different locations successively and samples the UV value on mouse click. This will take some time, however, as it’s not on the top of my list right now. I have a LittleRP which uses a mirror to reflect the image. 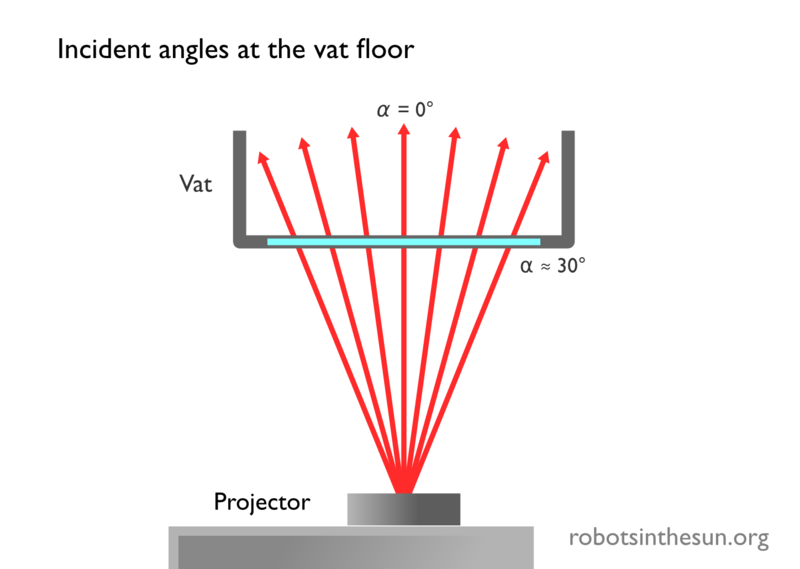 In your diagram above, it looks like the projector is facing straight at a vat. Now, in terms of homogeneous light how far should the projector be away from the mirror? As far back as possible? Once I’ve established this, I’ll start on the procedure. So I’d suggest you try setting your projector to the nearest and farthest zoom distance, position it so that the projection fits your vat each time and take a calibration image with these two settings. 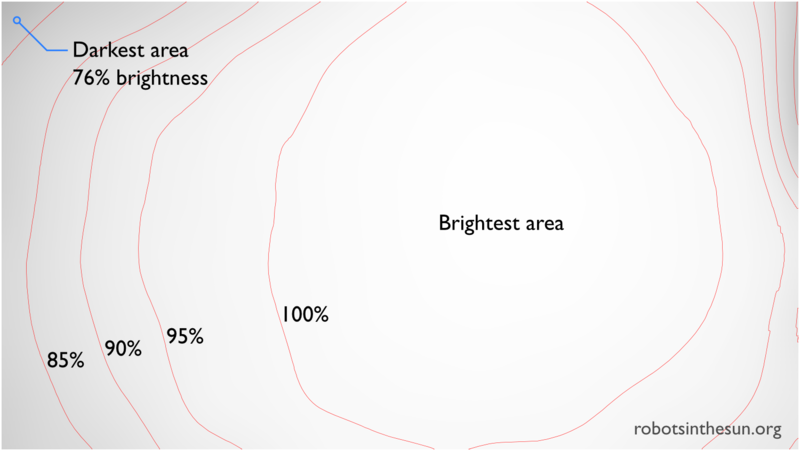 This way you can assess the effect of the distance on brightness homogeneity. Regarding the mirror: I don’t think there’s much of a difference between direct projection or via the mirror.